Real privatization is the right approach, and would mean an end to the era of special favors and subsidies. 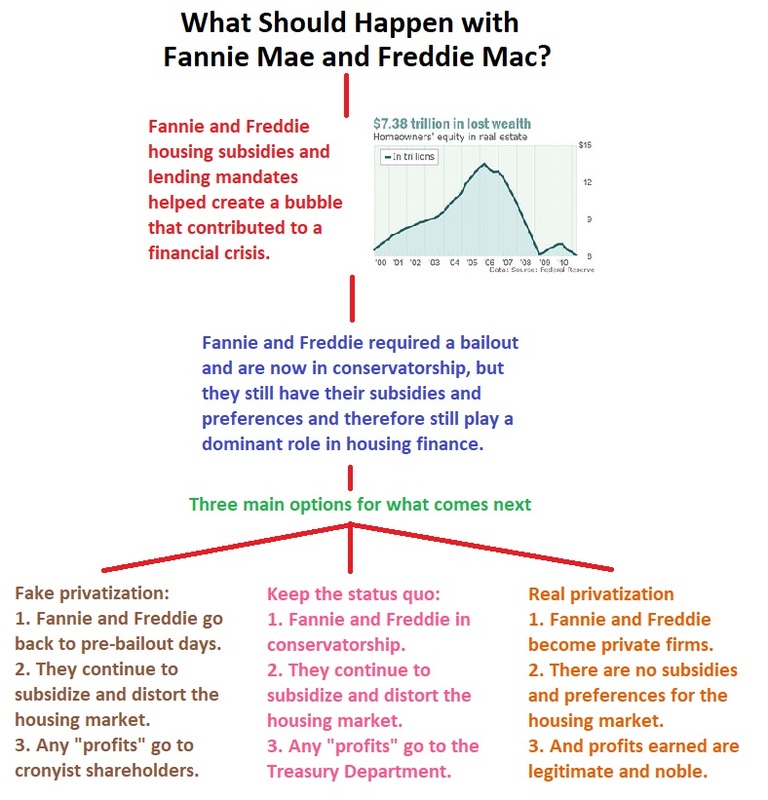 The good news is that Fannie and Freddie have been in “conservatorship” every since they got a big bailout last decade. And that means the two cronyist firms are now somewhat constrained. They can’t lobby, for instance (though Republicans and Democrats still seek to expand subsidies in response to campaign cash from other housing-related lobbyists). White House economic officials…are seeking to prevent a repeat of the risk-taking activities by the companies that contributed to the mortgage bubble, leading to its 2008 collapse and $200 billion government bailout. These officials, who spoke on the condition of anonymity, also say any reform must have the blessing of Calabria, a long-time libertarian economist and frequent critic of the outfit’s pre-crisis business model. He is also wary of returning Fannie and Freddie to their previous incarnations as private companies that have shareholders, but also receive backing from the federal government if they get in trouble as they did in 2008. But it seems that the Treasury Department has some officials who—just like their predecessors in the Obama Administration—learned nothing from the financial crisis. The bottom line is that Fannie and Freddie, at best, undermine prosperity by diverting money from productive investment, and, at worst, they saddle the nation with a financial crisis.